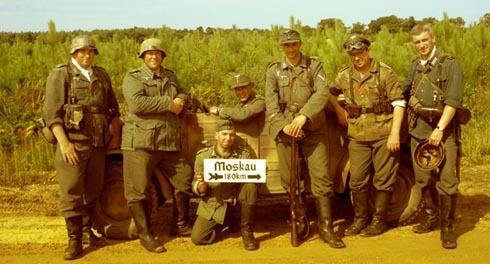 GD Recon portray rifle men of an armored reconnaissance unit within the elite 'Grossdeutschland' Division that mainly saw active service on the Russian front during World War II. 2009 sees them taking some exciting changes of direction with new members, new shows to attend, new ideas for displays, a new affiliation to the WW2 LHA and also the strengthening of existing links with English Heritage and Event Plan. It also see the launch of a new secondary impression with members portraying Grenadiers of the 'PzGr Regt 304' which will enable the group to fit in at Western front themed events should they need to. Members have many reasons for joining the group. Some have a keen historical interest in WWII, some have interest in the weapons and tactics used, others join for the 'Kameradschaft', but the main aim is to share the knowledge that they have about the conflict and the soldiers that fought in it. 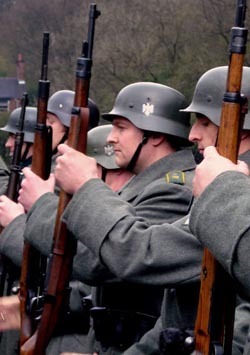 They also attempt to set high standards in all areas their portrayal's - from uniforms and equipment to living history displays and battle reenactments. As you will see from the pictures on their website, they attend many varied events throughout the season, from tactical weekends, to public displays and have taken part in TV & filmwork - the most recent being a series aired in Autumn 2008 on Channel 5. They are always on the lookout for motivated recruits with historical knowledge and a genuine interest in WWII and especially 'Grossdeutschland' (an interest in German beer is also helpful for when the public goes home! ).